Review ‘The Molecular Turn’: While Social Media Flourishes Ecological Systems are Collapsing. At La Panacée, Montpellier, Nicolas Bourriaud’s manifesto for a new movement and attempt to demarcate an artistic peer group." on frieze magazine. Max Andrews, co-founder of Latitudes and contributing editor to frieze, has recently reviewed the group exhibition ‘Crash Test. 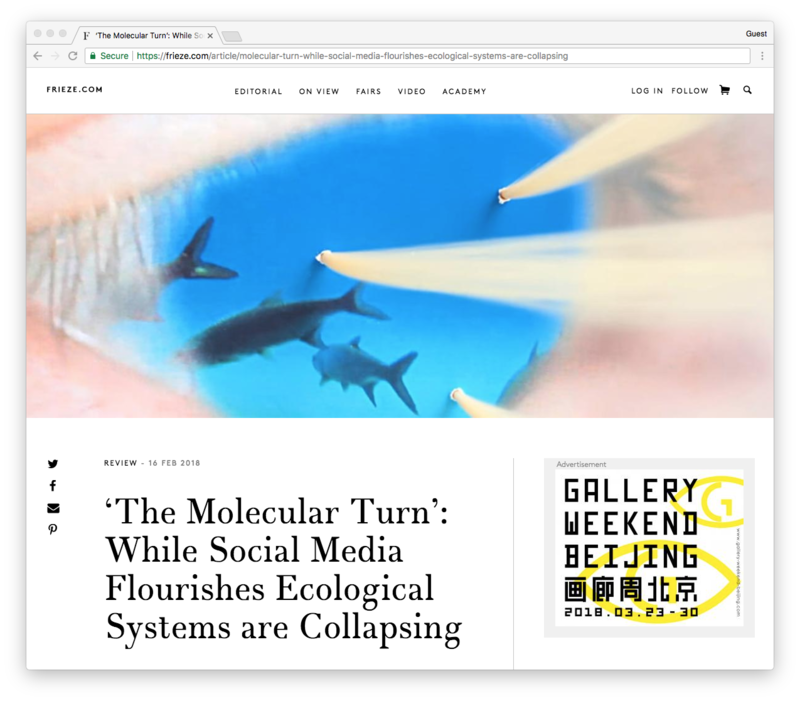 The Molecular Turn’ (at La Panacée, Montpellier, until May 6, 2018) as well as Lúa Coderch's solo exhibition ‘The girl with no door on her mouth’ (àngels barcelona, on view until April 13, 2018) for frieze. Both texts are available online and are included in print in the April issue. 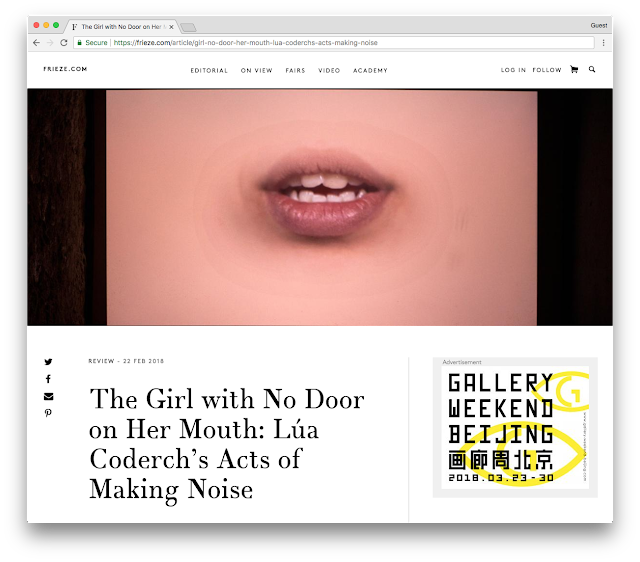 —> Video of Lúa Coderch presenting her work (Spanish with English subtitles). Review "The Girl with No Door on Her Mouth: Lúa Coderch's Acts of Making Noise. The artist explores the politics of the female voice that speaks out or is shut up, at àngels barcelona, Spain." on frieze magazine. 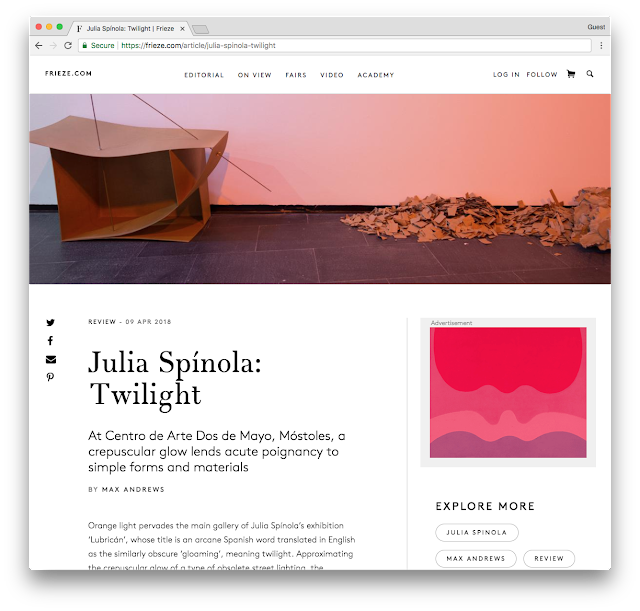 A review on Julia Spínola's solo show "Lubricán" at the Centro de Arte 2 de Mayo (Móstoles, Madrid), has also just been published online and will also be included in the forthcoming May 2018 issue. —> Video of Julia Spínola presenting the show (in Spanish). Review "Julia Spínola: Twilight. At Centro de Arte Dos de Mayo, Móstoles, a crepuscular glow lends acute poignancy to simple forms and materials" on frieze magazine.